Sonic Generations was a great game for the Sonic the Hedgehog franchise. The classic gameplay worked alongside the modern and once all was said and done both Sonics proved a delight to play with. Even reviewers liked it; Sonic was finally on form again after a troubling decade into the new millennium. However I also remember the pre-release period fondly, because being able to speculate which of my favourite stages from the past would be returning made me want to play through the whole of Sonic’s history all over again. So when the final stage roster was confirmed it was hard not to feel slightly let down by what was missing and even what had been included (so many city stages…). So I shall be looking now at which stages were ultimately hits and which ones sadly weren’t within Sonic’s grand anniversary adventure. When thinking of the best stages from the entire Sonic franchise, most will recall the glory days on the Sega Mega Drive before certain aesthetic themes became a given and the level design was at its best. Add to that the idea of seeing these stages reinvented in glorious HD visuals and a 3D environment, it’s no wonder one of the best stages of the game came from that fantastic era. However Green Hill and Chemical Plant don’t truly live up to their legacy in their reinvention mainly because both stages seem to end before they’ve even began. It was Sky Sanctuary which felt like the first full-fledged stage the game had to offer. Act 1 with Classic Sonic took long enough to complete that you really felt you’d visited and experienced the stage and Act 2 with Modern Sonic became the first stage that boosting your heart out on the first run wasn’t an option. Besides why would you want to blitz through this stage, stopping to take in the visuals is almost as delightful as dashing through them, the lush green ivy bursting out these grand structure feels like there’s so much life to be found in the sky ruins. The Death Egg looming in the background only adds to the sense of grandeur the stage has to offer. 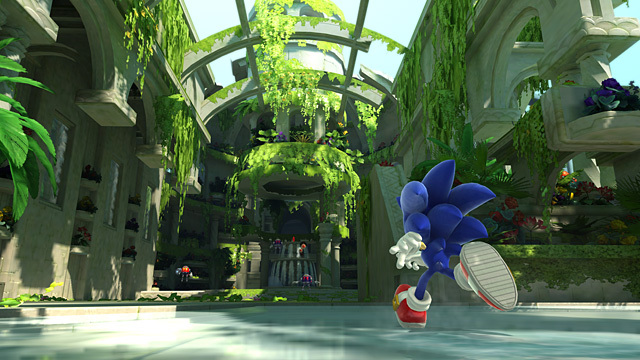 It’s no wonder Sega used Sky Sanctuary again in Sonic & All-Stars Racing Transformed; it’s simply one of the most special stages the franchise has ever seen. 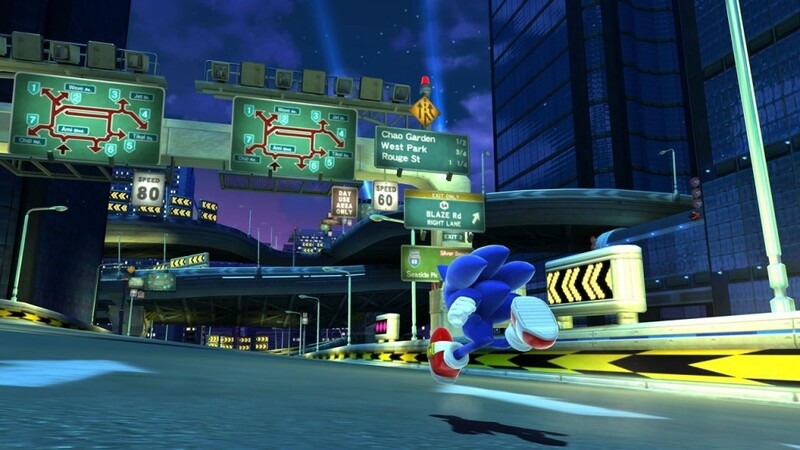 The problem with Speed Highway in this collection is that, with so many other city stages within the game, this one just feels too generic to stand out. The appeal of this stage in the original Sonic Adventure was that you finally had the chance to really run at top speed in a way the series hadn’t done before, thanks to the 3D environment. Unfortunately in Sonic Generations Green Hill gives the player such an intense feeling of speed that Speed Highway just doesn’t feel so fast anymore. Furthermore the stage feels particularly like Skyscraper Scramble from Sonic Unleashed, only at night time and with recycled music and a certain set piece from the past. Of course these are all gripes with the Modern side of this stage; however the Classic Act 1 doesn’t do much for the stage either. Rather than racing along a highway it’s a very platform heavy stage among skyscrapers which sadly doesn’t stand out as much when other cities within the game have particular motifs that set them apart. I suppose in retrospect this stage embodies the largest complaint about Sonic Generations from the fan base; there are simply too many city stages to play through and this one just so happens to remind us of this most of all. 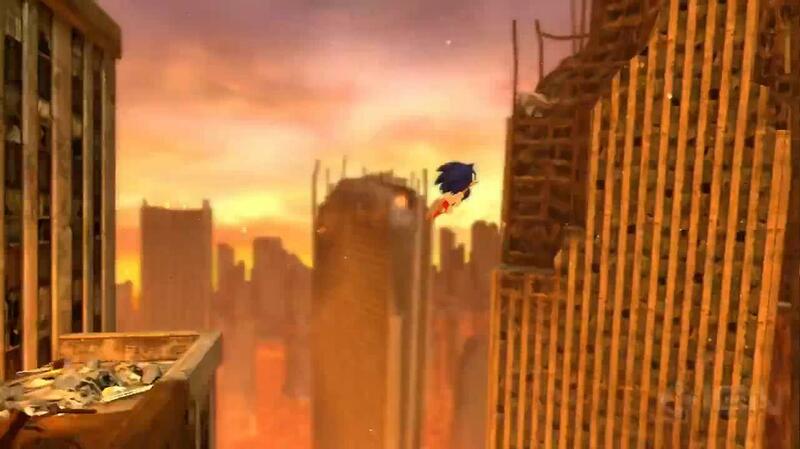 Don’t get me wrong it’s not the city motif that lets the game down, just the way this particular stage uses it. The next stage however does the city motif right. I remember reviewers for the game stating that the Modern Sonic stages during the later game didn’t complement the controls very well. However I remember when I first set off in Act 2 of this stage I suddenly felt that the game was finally showing me what it was capable of doing. The stage wasn’t easy at first for either iteration of Sonic but what is particularly encouraging is how the set pieces this time not only encapsulate the idea of speed but also skill at the same time. No more are we running away from trucks in a dramatic yet somewhat gameplay less moment; running down the highway here is dangerous at every corner and yet the speed adds to that sense of exhilaration when you manage to dodge the fatal obstacles along the way. The Modern side of this stage really understood how the flow of this rollercoaster platform could work as even when you’re stomping down lava plumes there’s always something to encourage you to charge forward again directly afterwards. However it was Classic Sonic who really shone here as never before had we seen the Hedgehog travel through a flaming tornado. The cool, calm and collected hog was certainly put on trial during this stage. After Chemical Plant, Speed Highway and City Escape I thought another city would be tedious to play through, especially one I didn’t expect (still in shock that Kingdom Valley wasn’t chosen to represent Sonic 06) but this one ended up standing out well above the rest of them. It’s nice this stage got a second chance, turns out it’s quite good when it’s not broken by a broken mess of a broken game. Sadly the next stage I’d like to discuss is Planet Wisp, the game’s final full stage. 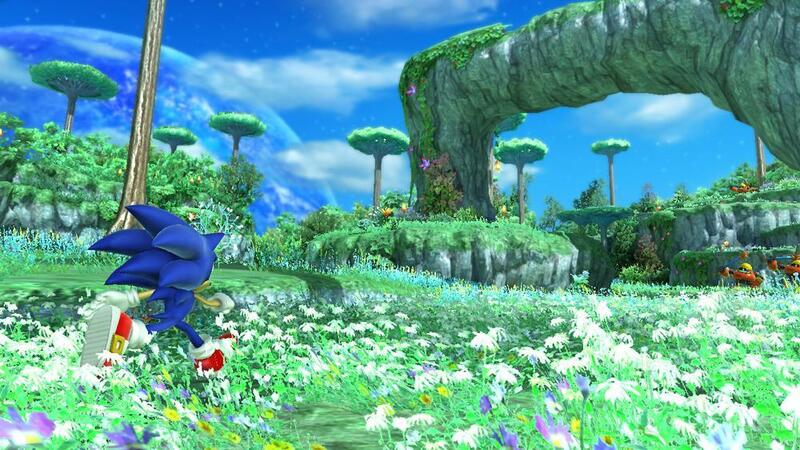 Really this stage has the unique factor compared to the others, with the Wisp powers returning from Sonic Colours albeit limited to one per Sonic. Unfortunately however it comes off as perhaps the worst stage within the game because of this. The Wisp powers feel very out of place considering they’ve appeared at the very end of the game and like within Sonic Lost World it almost feels like they weren’t needed. I understand the desire to replicate that Sonic Colours feeling but the level feels so restricted by narrow corridors of puzzles because of them. The platform segments are no longer embedded within the stage; rather the focus here is the power ups are what make it memorable. Ultimately the extended length and difference in focus that this stage brings about feels more like it is a side venture than an opportunity to use everything you’ve learned in the game so far for one final challenge. While Sonic Colours is perhaps the best-rounded Modern Sonic title to be released, the attempt to revisit it here jars with the package that the rest of the game has to offer. The Planet itself looked absolutely beautiful in HD though. It’s just a shame that at the last minute I’m not testing the skills I’ve picked up in the game, but instead I’m learning new ones. 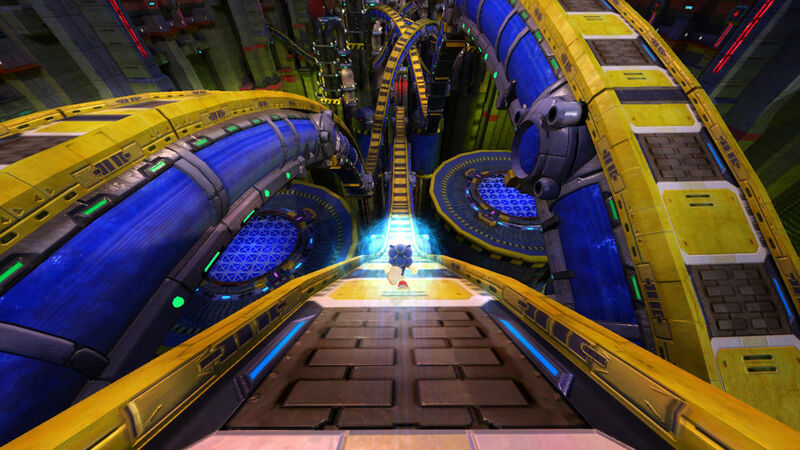 As a final note, while none of the stages in Sonic Generations really dramatically differ in gameplay style from one another I feel it’s worth mentioning Chemical Plant on a side note for one reason alone. Remember the original stage, when the water starts rising and you have to climb up a narrow corridor quickly before the TERRIFYING countdown begins to commence the drowning sequence. Overcoming that feat was satisfying enough but after practicing one could get out that corridor without even touching the water; which is most satisfying indeed. Well there’s a trophy/achievement within the game which can only be obtained by completing Chemical Plant without touching the water. It’s a nice homage to a moment from the original series that still haunts me today but it’s also worth noting that this trophy showed what could have been implemented in the game to encourage the replay ability that the game needed. It’s a weird inclusion when you consider there are no other challenges like this within the stages and had more specific tasks like this been included then perhaps we’d have been even more encouraged to try out different methods to tackle each level other than speeding straight through it along the quickest path. We never really know where Sonic the Hedgehog will go next however despite that Sonic Generations will live on as Sonic’s most modern success and a game to play for years to come. While it is short it only adds to its charm as something to pick up and play like the original games way back from the early 1990s. With the release of Sonic Boom reinventing part of the franchise is I still hope that someday Sega shall return to the ideas of this game in the core series and give us the more that I still crave. If you want to read more about my feelings on Sonic the Hedgehog, check out my article on his recent string of video game outings. Previous Previous post: Would you buy The Lord of the Rings: The Video Game?